There are creations that simply won't die, unlike their creators. Three-quarters of a century after pulp writer Robert E. Howard died in the tiny town of Cross Plains, Texas, the literary products of his fevered, melancholy imagination are alive and prospering. A movie is in pre-production about his Pictish hero Bran Mak Morn. His short story "Pigeons from Hell" was expanded into the recent fright film "Dead Birds." Fantasy conventions are held in Howard's honor, and Cross Plains holds an annual event called Robert E. Howard Days. All of this is eclipsed by Howard's singular invention, a sullen barbarian of the fictional Hyborian Age, a "thief, a reaver, a slayer, with gigantic melancholies and gigantic mirth," who became a king in a time lost to history. Conan the Barbarian, aka Conan the Cimmerian, is one of the great literary characters, right up there with Tarzan and Sherlock Homes. And, like the Lord of the Apes and the Baker Street Irregular, Conan is also a commercial phenomenon, selling millions of books. There was a kind of Howard boom in the early 1970s, sparked by Lancer Books' reprints and stoked by Marvel Comics' colorful retellings, and although it has waxed and waned over the years -- like the lost continents and howling wildernesses in Howard's tales -- Conan is firmly a part of pop culture. Since 2003, Dark Horse Comics has taken the franchise and is milking coins out of that cash cow. 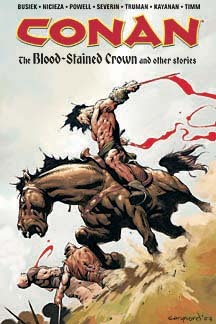 In addition to retellings of Howard's world with original works, they're also reprinting some of Marvel's Conan works. First, the reprints. Printed on pulpy paper -- ironically but not aesthetically pleasing -- the black-and-white stories are from Marvel's magazine-size "Savage Sword of Conan," a high-profit format inspired by Warren's "Creepy," "Eerie" and "Vampirella" titles. The Dark Horse reprints are not kind to the finely detailed art, alas, seemingly washed out and bleached-looking. But the stories still hold up and trigger a lot of memories -- has it really been 30 years? -- primarily of Filipino artist Alfredo Alcala's frankly amazing brushwork. At the other end of the printing spectrum are Dark Horse's "graphic novel" printings of stories cobbled together from their comics line. The latest is "Rogues in the House," collected from issues No. 41 to No. 44 of the comic line. Adapted by writer Tim Truman and drawn by artists Cary Nord and Tomas Giorello, the real heroes are the digital colorists who bring the sketches to life and depth. The color reproduction here is simply first rate, and Truman's canny editing of Howard's dark prose into visual terms makes the tale rocket along with adventure and humor. The Hyborian Age lives again! The question is, Why? What is it about Conan that stirs the imagination, makes a fictional character memorable? Conan himself is kind of an ultimate pragmatist -- god or monster? Poke it with a sword to find out -- and arose out of Howard's imagination in the late 1920s, when social Darwinism was all the rage. Mussolini would recognize Conan as a compatriot, but why does the Cimmerian survive today? Armchair tough guys like George W. Bush wouldn't last an hour in Conan's world. Ancient-history aficionado Howard, who wrote workmanlike, highly vivid prose characterized by headlong adventure and little reflection, knew his audience was reading to escape. A loner who typed 18 hours a day, writing hundreds of stories and poems, Howard himself escaped into his own imagination. He was aware of that. But when Conan came along, Howard was surprised at the torrent unleashed. "Conan simply grew up in my mind a few years ago when I was stopping in a little border town on the lower Rio Grande," Howard wrote a friend. "I did not create him by any conscious process. He simply stalked full grown out of oblivion and set me at work recording the saga of his adventures." A possible explanation, wondered Howard, was that Conan had been real, a kind of ancestral memory that channeled a dark and violent past. Howard wrote another friend: "While I don't go so far as to believe that stories are inspired by actually existent spirits or powers, I have sometimes wondered if it were possible that unrecognized forces of the past or present -- or even the future -- work through the thoughts and actions of living men. This occurred to me when I was writing the first stories of the Conan series especially. ... Conan seemed suddenly to grow up in my mind without much labor on my part and immediately a stream of stories flowed off my pen -- or rather, off my typewriter -- almost without effort on my part. I did not seem to be creating, but rather relating events that had occurred. Episode crowded on episode so fast that I could scarcely keep up with them. For weeks I did nothing but write of the adventures of Conan. The character took complete possession of my mind and crowded out everything else in the way of story-writing."